Здесь вы можете прочитать биографию Григория Распутина на английском языке. Grigory Rasputin (22.01. [O.S. 10.01.] 1869 - 29.12. [O.S. 16.12.] 1916) - Russian Orthodox Christian and mystic. 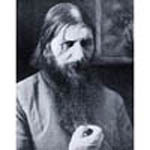 Grigory Efimovich, later known as Rasputin, was born into a peasant family on January 10, 1869 (old calendar) at Pokrovskoye, a village located in the province of Tobolsk, Siberia. Rasputin received no formal education and lived as a peasant. His marriage to Praskovia Federovna, celebrated in 1895, was followed by the birth of several children. In the early 1900s, Rasputin's commitment to his family waned in relation to the interest he now took in religion. He may even have adopted the views of the outlawed "Khylysy" sect which sought salvation through repentance and seems to have involved the commission of acts of sensual licence for which repentance was necessary. He acquired a local reputation as a starets, or holy man, and his subsequent wanderings took him far outside Russia - as far indeed as the Athos Peninsula on the coasts of Greece and even as far as Jerusalem. In 1905, during a visit to Saint Petersburg, then the site of the national capital, Rasputin met a theologian who was the head of a religious Academy and confessor to the Empress. He was presented at court through the patronage of high church officials and of a group of ladies who were influential at court. The Russian royal family had had a tradition of giving attention to holy men in order to seek their intervention in many ways including that of attempting to secure the birth of a male heir to the Russian throne. Czar Nicholas noted the occasion in his diary on November 14, 1905: "We have come to know a man of God, Gregory, from the province of Tobolsk." Some time thereafter Nicholas entrusted him with the office of imperial lampkeeper -- he was to tend the numerous lamps burning continuously before the highly valued palace icons at Tsarskoe Selo, a principal royal palace located close to Saint Petersburg. Rasputin made a deep impression on the Czarina (Empress) Alexandra Fyodorovna. He seemed, on several occasions, to be miraculously able to relieve the suffering of the dangerously, (life-threateningly so!!! ), haemophiliac heir to the Russian throne, Alexis Nikolayevich, leading to his eventually becoming the most influential person in the imperial entourage. Rasputin's influence was increasingly felt in Russian society, in the appointment of Bishops, even in politics. After 1911 many high government offices were filled by his appointees, most of whom were incompetent. World War I irrupted in 1914 and, in this conflict, the armies of the Russian Empire were deployed in opposition to those of the German and Austrian "Central Powers." When Emperor Nicholas II went to the front to take personal command in the autumn of 1915 Rasputin became the decisive influence in the government, advising Alexandra on the conduct of internal affairs. The armies of Russia did not fare well in the wars, the despair of the people arising out of hunger and disease as well as an appalling casualty rate led to murmerings against the Czarina as a "German woman" and against Rasputin "The Dissolute" her sinister advisor who was held to have indulged in many scandalous relationships with the ladies of the court and even with the Czarina herself. Rumors circulated that Rasputin was actually conspiring with the Central Powers to bring about a Russian defeat - he had become an object of popular hatred. In mid December, 1916, a group of aristocrats of the highest social position, including a nephew and the favourite cousin of the Tsar, invited the "mad monk" Rasputin to a "supper" at the Yussupoff palace. These aristocrats did not really intend to entertain their guest but rather were planning to bring about his death. The Czarina and Czar were outraged at the murder of their favourite. The Czarina had his mortal remains interred in the grounds of Tsarskoe Selo - she prayed regularly in a special chapel she had built nearby. Rasputin's influence over the royal family was partly responsible for the rising tide of discontent that led to the downfall of the monarchy in the serious domestic upheavals that culminated in the Bolshevik Revolution of 1917.